Firstly the little girl in the heart sunglasses; talk about off the chart adorable. 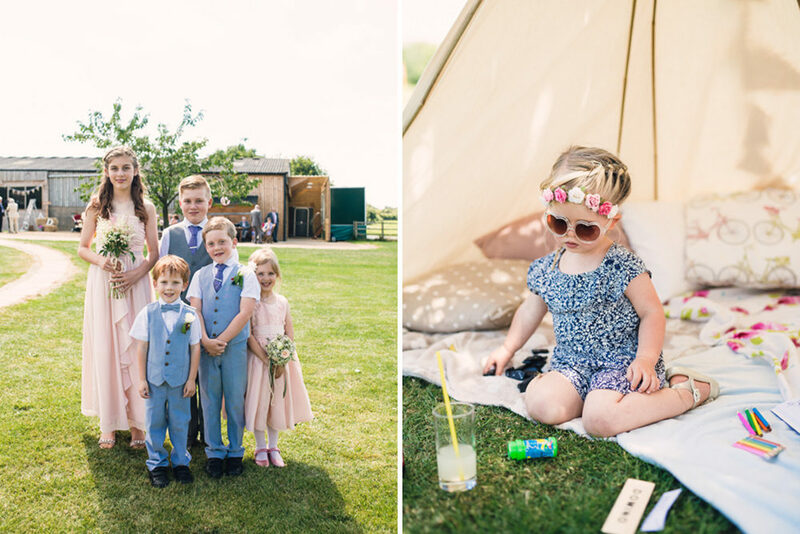 She very nearly stole the show until I saw the rest of this sunshine filled outdoor wedding at Furtho Manor Farm. Bride Amy for a start looks SOO beautiful. 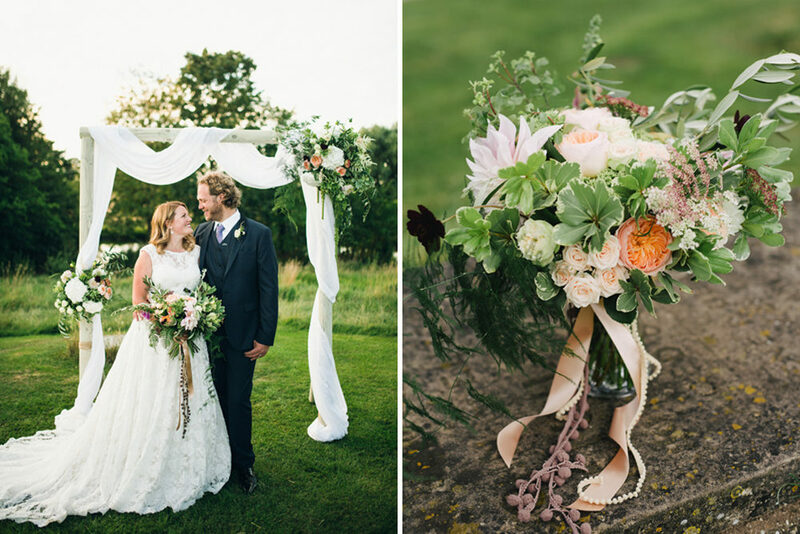 Her lace Justin Alexander dress is absolutely heavenly as is her peach perfection bouquet full of Juliet roses, which are also echoed in the ceremony altar. The table centrepiece flowers however came from Amy’s garden, all homegrown and adding a personal, sentimental touch to the decor. 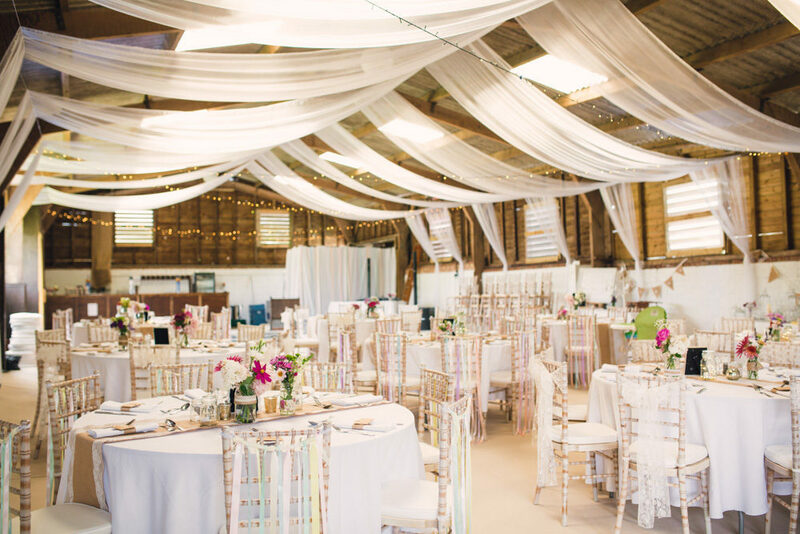 Huge radiant dahlias perfectly set off the rustic hessian and lace tables runners, with colourful ribbons and lace hung from the chairs, bringing the WOW factor to the venue. The relaxed, fun vibe of their day continued with garden games, (Tin can alley anyone? 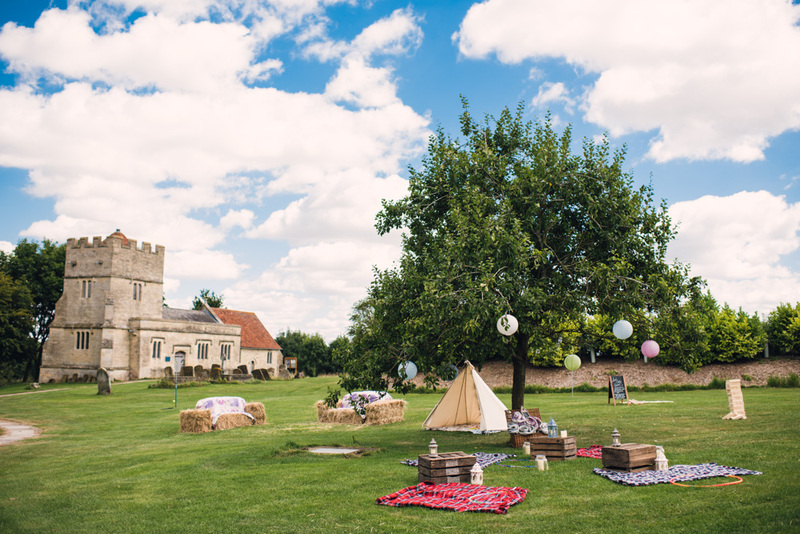 ), a barbecue buffet style wedding breakfast, dancing into the night and bubble guns & mini tipis for the children to play in. 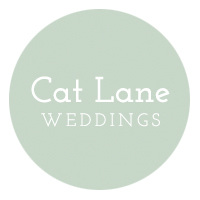 The lovely Cat Lane Weddings was on hand to capture all the details, love and more. You ready to take a look? Andrea the Bride: We have been together for nearly ten years, and David tried to ‘pop the question’ for many months but it never felt like the right time until his 30th birthday in January 2016, when after opening his presents from me he presented me with a big bunch of yellow balloons and a pin. After popping a few, one little balloon floated to the ceiling with a ring attached. It took a moment for it to sink in and then he was down on one knee with the most beautiful ring I’d ever seen that he had designed himself and got made. Obviously it was a yes! And decided we didn’t want to wait until next year or the year after and that we wanted to marry this summer if possible. We quickly found a perfect venue that was exactly what we had in mind, and after going to visit with my parents we booked it for August the 6th 2016 – my birthday! That gave us 6 months to plan a wedding. Furtho Manor Farm was perfect, it was in a beautiful setting, with wonderful people who own and run the farm, it had an empty barn and lots of land which meant there was scope to do whatever we wanted and weather permitting we could get married outside. We didn’t need to look at any other venues. 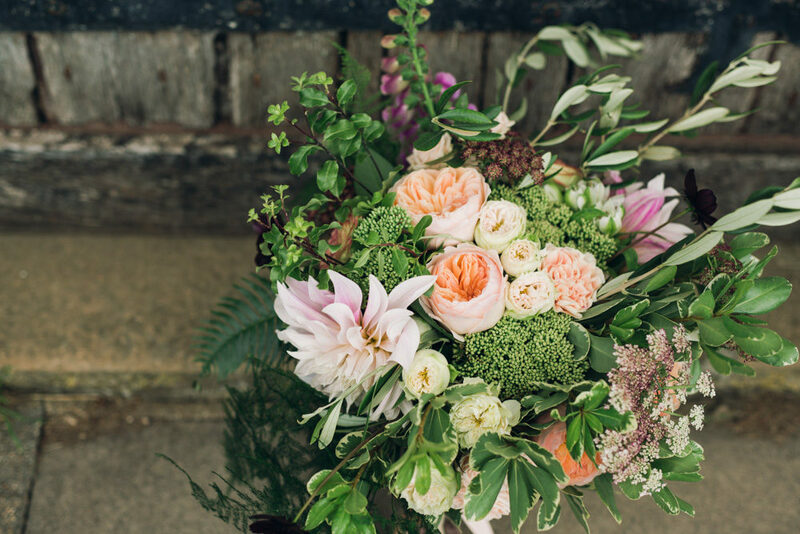 The rest started to fall into place, we already knew who we wanted as our photographer and florist who have both worked together many times before and lucky for us they were both free! 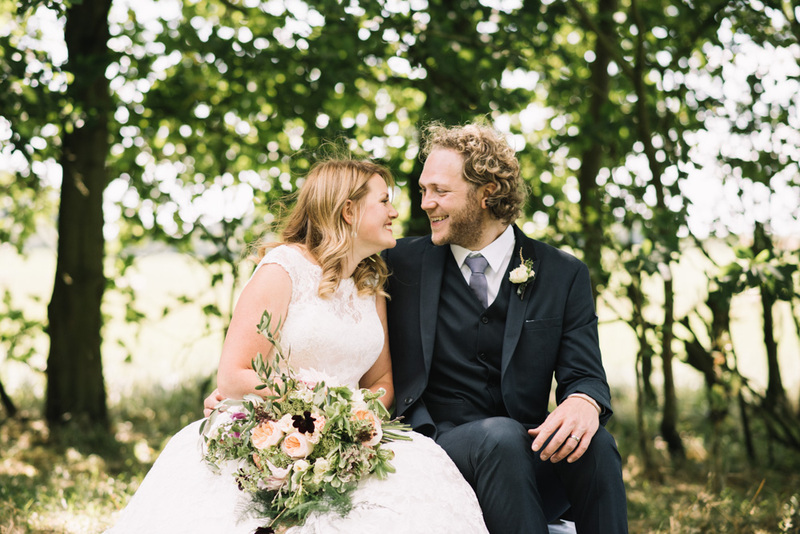 Cat Lane (photographer) and Noeleen (florist) were both an absolute joy to work with, and helped us create exactly what we had hoped for, the photos and flowers were just beautiful. 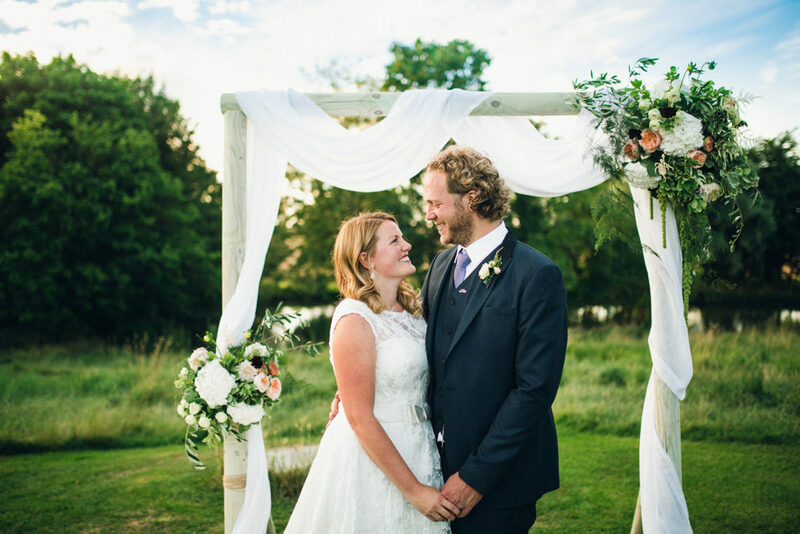 Mcgees – who helped us decorate and furnish the barn and the caterers were also free on our wedding day and were so helpful, and so soon we were putting together our perfect day. 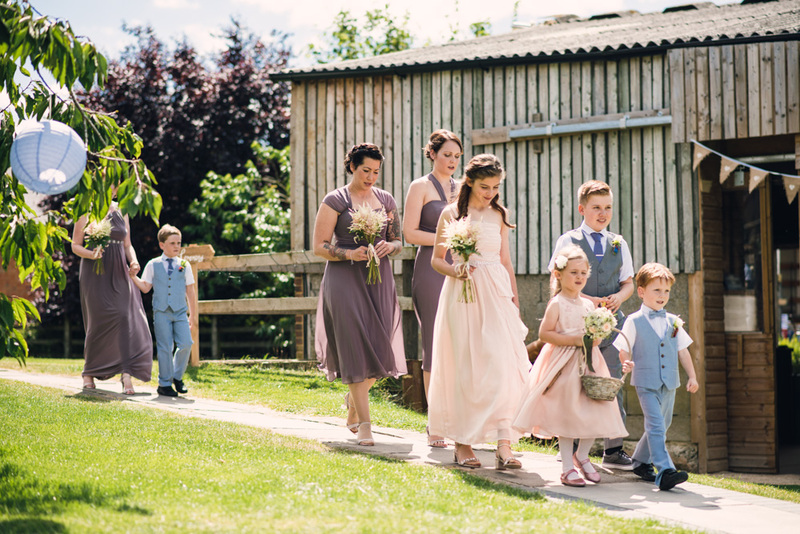 We didn’t have an overall theme or colour scheme, we mainly stuck to soft pastel colours in the barn and with the flowers and lanterns, but this wasn’t important to us, we didn’t want to be limited to what the groomsmen, page boys and bridesmaids wore as we just wanted them to feel comfortable. My Maid of honour and bridesmaids wore vintage inspired mink purple dresses from Monsoon which you can wear different ways which was great to help them create their own style and my two nieces wore blush dresses from BHS. David and his groomsmen wore suits from ASOS, smart but not too formal, and David was adamant he wanted those shiny shoes! The Page boys wore grey and light blue suits from BHS, our eldest nephews wore matching ties to the Ushers and the little two wore bow ties which were just adorable! I wasn’t looking forward to finding a wedding dress, I don’t have a lot of confidence and was dreading the attention but Nicola at George James Bridal was so warm and put me at ease straight away and helped me find a beautiful Justin Alexander dress. I love classic and vintage style dresses so it was perfect. I didn’t look anywhere else, I bought it that day! I did my own make up on the day and our hair was beautifully styled by my friend Anika at Bluebird Hair Boutique. We wanted to do as much as we could ourselves, not only to save us money but because we knew we would enjoy doing it. I am a keen gardener and so wanted to try and grow the flowers for the tables myself, after speaking to the florist and getting some much needed encouragement that’s exactly what I did! 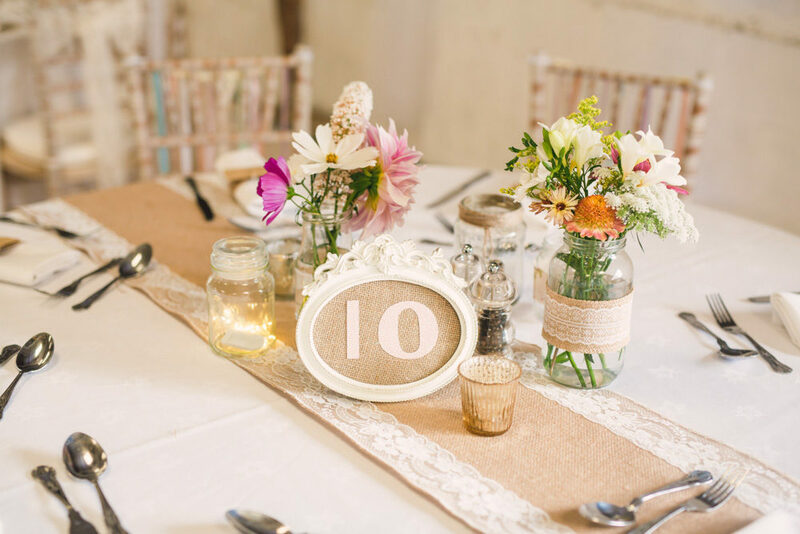 Other homemade touches included the DIY jars (helped decorated by our friends – our Usher Matt and his soon to be wife Kate) table numbers, the A and D that was placed outside, signs, the ceremony archway and the buttonholes for the page boys made with their favourite action hero! The cake was made by a family friend Janet, our invites by my best friend and bridesmaid Felicity, Even my dads’ watering can he got given as a wedding present 44 years ago made a feature! We had planned to hire or buy everything we had needed but we met Melody at a wedding fair at Furtho Manor Farm and she had lots of items that were perfect, for us, she met with us and talked through what we had left to do and wanted to achieve and she helped us to create exactly what we had envisioned…she was a star! She provided the little touches that really made the day, the lovely lounge area, beautiful lanterns, and not forgetting the games which provided a lot of fun for children and the adults! 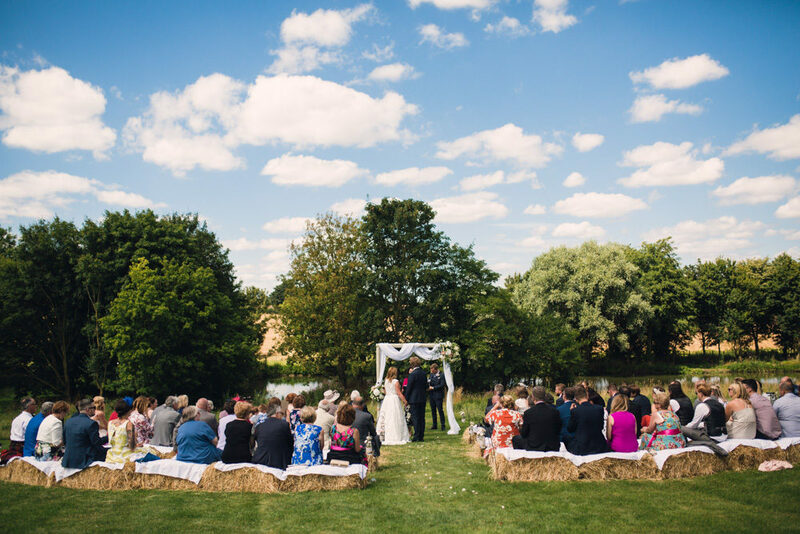 The ceremony was the most important part of the day for us and we held it outside by the waterside led by Robby our celebrant, which was truly beautiful. The ceremony which we part wrote ourselves was filled with love and sentiment with lovely readings from friends Luke who couldn’t be there and my oldest and dearest friend Rachel, the words meant everything to us and it will be something that we will treasure and never forget. After the ceremony we had bubbles that were given to each guest instead of confetti, followed by canapés with music from the amazing band which helped everybody relax and enjoy the outside seating areas and games to play. After a relaxed BBQ dinner, DJ’s played our favourite song and led everyone to join us on the dance floor to get the party started! Lastly but importantly……..Thank goodness the sun was shining!